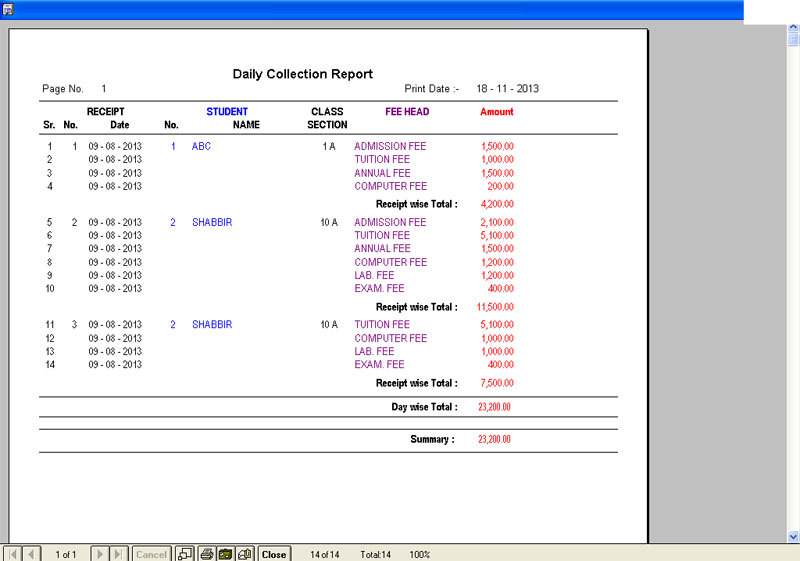 The Salient Features of School /College Fees Tracking Management and Accounting Software. 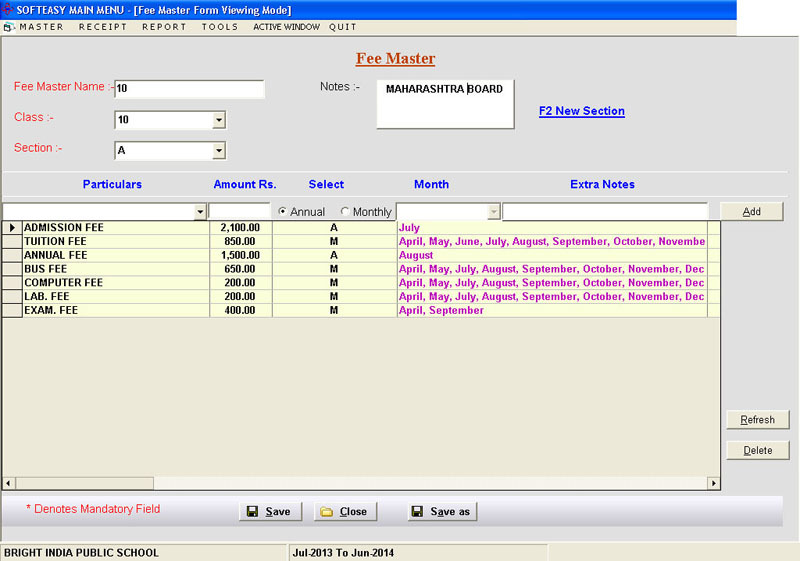 The School Fees Software manages the Student Fees and the administration of the School organisation. The Student Fees Software takes over the complete control of the whole administration of the school in terms of students syllabus fees, Tuition fees bus fees, term fees, picnic charges etc and etc. 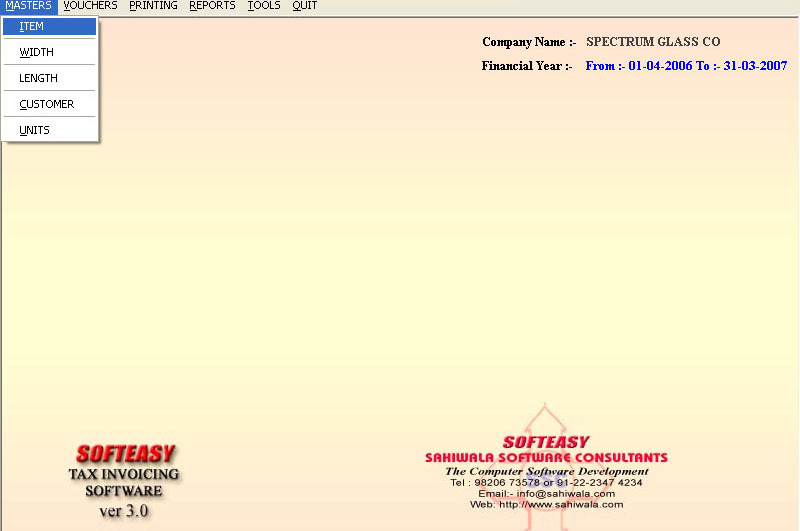 The school Accounting Software is very easy to use and user friendly. 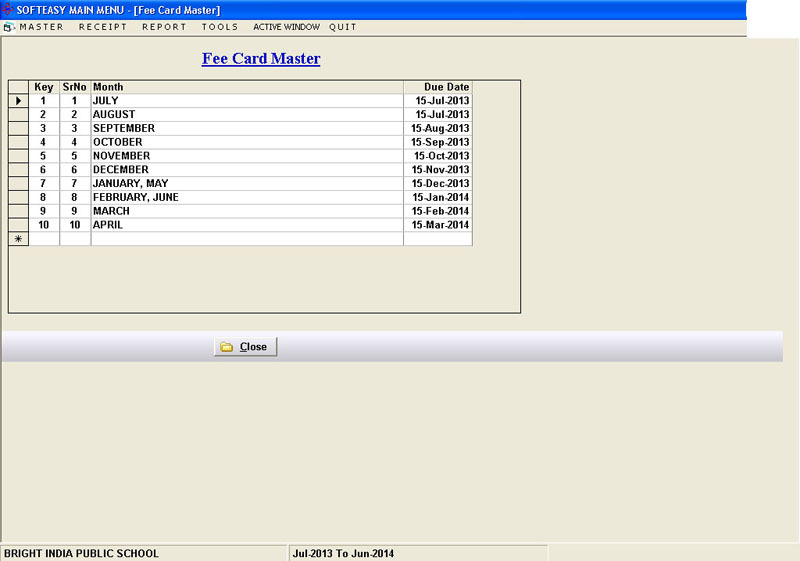 The School Management Software creates the master of the student, Fees master, Bus Stand Master, Class Master, .Fee Master and Fee Card Master. 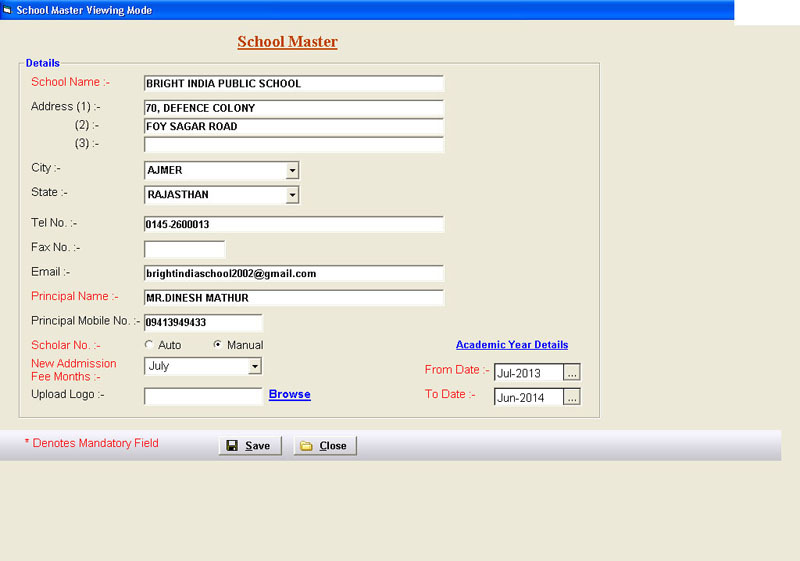 The School Administration Software is highly automatic software which incorporates the varied data entries of a particular student only once so as to give timely reports at any point of time. The Receipt entry of the student is the readymade in the sense the end user has nothing to get worried to input the different data again as he has to feed only one code number which is assigned to the every student by the software at the time of creating the master. He has just to feed the number of the months for the amount of the fees to be get paid. The code number i.e. 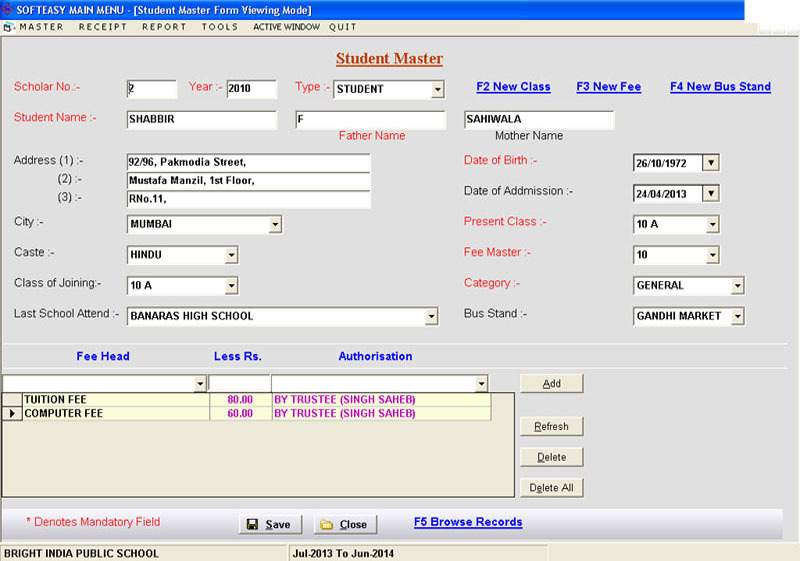 scholar number identifies the student which gives the complete details of his Fees structure,Class Structure, Bus Stand Structure, and also its previous records like the last school attended by him which is auto filled by the software. 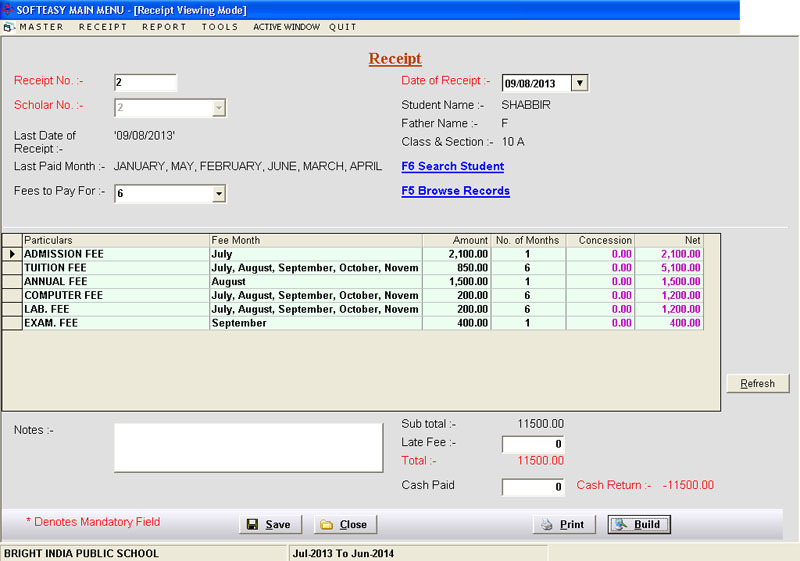 The School Administration software gives the timely reports for the daily collections, paid fees reports, outstanding and unpaid fees reports of each and every students.The reports also can be bifurcated by the head wise, student wise and even the month wise too.The Software prints the receipts to be given to the person who makes the payments at the school office and this can be customized by the software itself its design, layouts and templates. The Receipt printout may be simple receipt directly from the printer or it may get printed on the pre printed receipt voucher made by the school. The School Software is easy to use and multi user, The Software can also goes beyond which might include some other exclusive features like annual day celebrations fees, Inauguration, invitations, seminars, sports and other activities too. Not only it covers the data entries of the above events but can go in to in depth analysis and reports and final feedback so as to make control over them in terms of timely budgets and proper plannings. 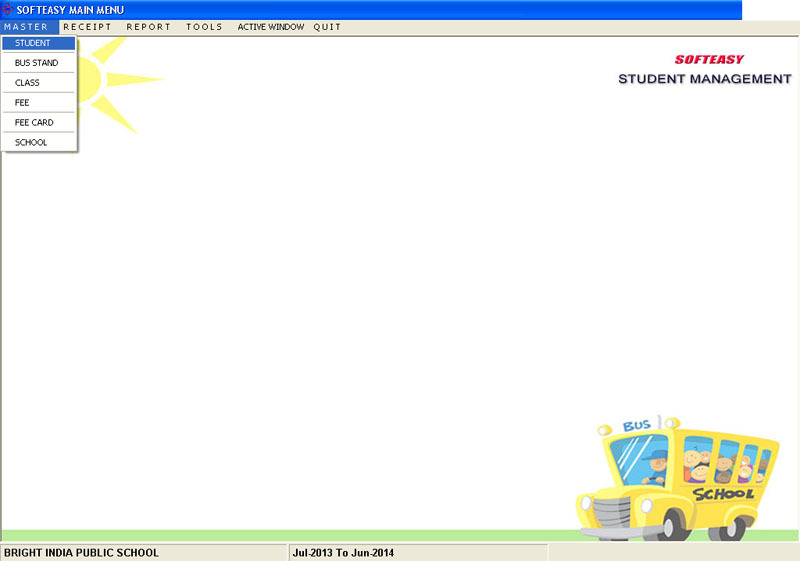 Main Menu of student Master Screen. 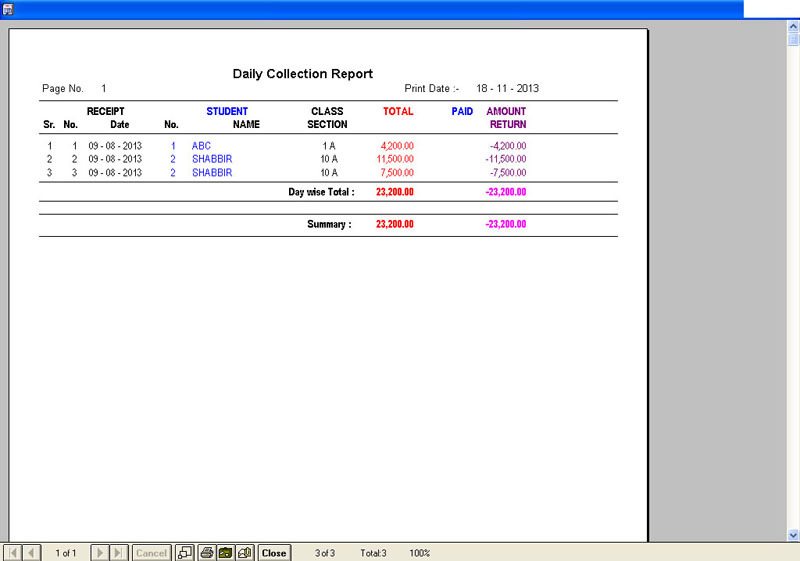 Receipt Voucher Data Entry Screen.